Shereen Jones is tasked with overall responsibility for Information Technology across The Jamaica National Group. She has over 25 years experience in IT, spanning multiple industries with significant focus on financial services, and has managed engagements in several countries, both regionally and across three continents. She joined the JN Group in 2006 as General Manager of Management Control Systems (MCS) and assumed the position of Group Executive – Information Technology, in October 2009. 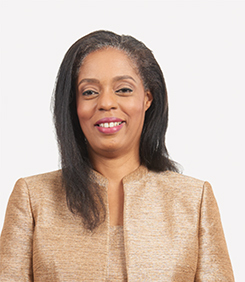 However, her association with the Jamaica National Building Society began in 1999 when she assisted with the implementation of the Phoenix Banking system as a consultant. Mrs Jones was appointed Assistant General Manager of the JN Group in February 2013. Her title was changed to Chief Information Officer for The Jamaica National Group when JNBS was restructured and JN Bank launched on February 1, 2017. In October 2013, the Jamaica Computer Society presented her with a lifetime achievement award for outstanding contribution to the ICT Industry.